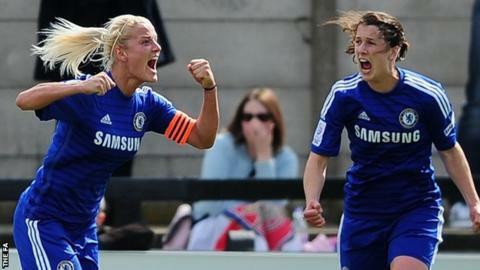 Women's Super League One leaders Chelsea will face Manchester City in the semi-finals of the FA Women's Cup. Chelsea knocked out holders Arsenal on Sunday, while City beat 2012 winners Birmingham City. In the other tie, last year's beaten finalists Everton, the only WSL 2 side left in the competition, will face top-flight side Notts County. Everton beat third-tier Charlton on penalties in their quarter-final, while Notts County thrashed Aston Villa 5-1. This year's semi-finals will be held at neutral venues in early May and details will be confirmed by the Football Association in due course. The final, on 1 August, will be the first to be held at Wembley. Everton are the only former winners left in this year's competition. They face a County side who have never reached the final in a repeat of last year's semi-final, which Everton won 2-1. Chelsea have a 100% record so far this season, while Manchester City have picked up four points from their first two league games of 2015.